Des Moines’ food culture continues to diversify. 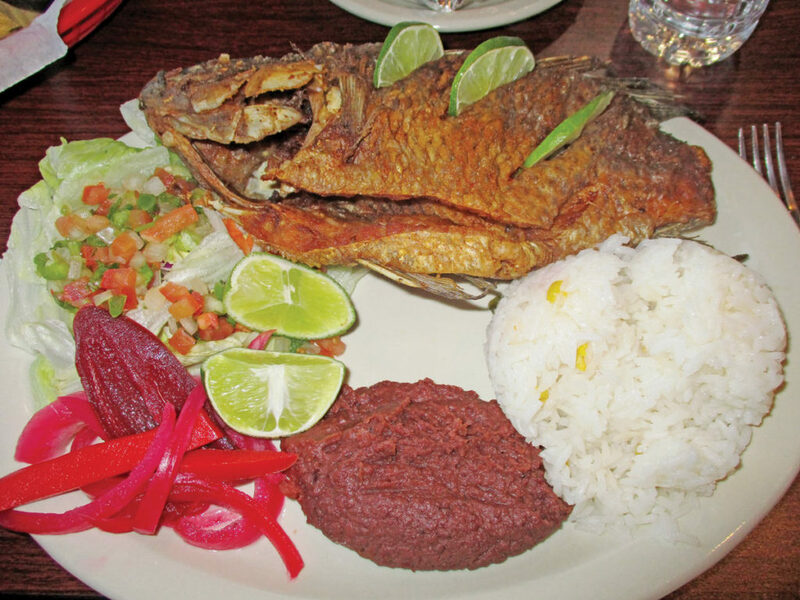 Whole fish at El Pollo Catracho. Des Moines’ food culture has been diversifying and sophisticating for the last 15 years at a pace no one foresaw when it started. Two recent openings suggest that such things are still gaining momentum. The Des Moines Art Center Café reopened under the management of Tangerine, a catering company with serious street cred. Its principle owners have culinary backgrounds that touch with some of most legendary restaurants of the 19th and 20th centuries. Susan Madorsky worked at the Stanford Court in San Francisco and The Willard Hotel in Washington, D.C. Yes, that is where Abe Lincoln lived before his inauguration. Oh, and she was a pastry chef at Stars in San Francisco when Jeremiah Tower was running the place. Tower is the most legendary living chef in North America. CNN made an hour-long documentary about him last year that was simply titled “Jeremiah Tower: The Last Magnificent.” Alice Waters admits that she was nothing more than a hostess when Jeremiah made her Chez Panisse the most famous restaurant west of New York. Any connection to Tower makes the best chefs in Des Moines green with envy and respect. Cheri Madole graduated with honors from New York City’s Institute of Culinary Arts Pastry and Baking program. She worked in the pastry kitchen of Cafe Boulud. That’s Daniel Boulud’s Upper East Side café. He’s close to being the Lyonnaise version of Tower. My point is that Tangerine has game, and the Art Center is the first place in town where that game is open to walk-in diners. The venue, by Richard Meire, includes the architect’s personal furniture designs. The menu, lunch only, is simple and seasonal. Expect a couple soups (sweet potato and chili plus lentils in chicken stock on my visits), a couple salads, Greek and lemon salmon, a pasta (asparagus with prosciutto), a panini, a sandwich, a burger and a quiche. There are also four or five desserts including homemade ice creams. On my last visit, a daily special of duck confit egg rolls was offered and delighted me. The burger and the egg rolls are completely new to the venue, which has prohibitions on frying indoors because of the art insurers. The place was packed at 1:30 p.m. I was the only male customer. That reminds me of three owners ago, when Lisa Lavalle ran the kitchen and the dining room was packed. On the southeast side of town, Des Moines’ first Honduran café is up and running. El Pollo Catracho (Honduran Chicken) is a delightful, friendly café with a short menu of Catracho delights. The food is not too different from most Mexican places in town. Mainly, tajadas are offered here. These are wonderful fried chips of plantain. You can substitute beans and rice, but the beans are blacker and thicker than what one might expect in a Mexican café. Other accompaniments include pico de gallo with lettuce and cabbage and pickled onions. The tortillas were wonderful with the thick masa grilled with a slight char. Salsas included green and bean. Daily, 9 a.m. – 10 p.m.